The boyfriend aka « the berry man » brought home 2 massive bags of frozen blackberries. As it is quite a precious fruit, according to its price, I wanted to create a recipe that would make the blackberry the star of the show. 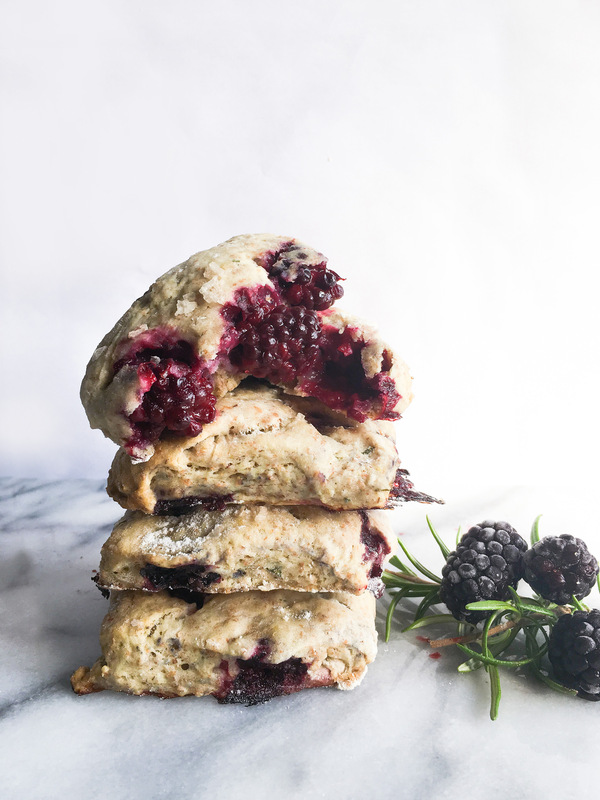 So here is my recipe of vegan blackberry, rosemary and fleur de sel (La Belle Excuse) scones. You can eat them as is or with a touch of maple syrup or even for the Sunday morning brunch with a touch of coco whip. So delightful! In a large bowl, add all the ingredients “FOR THE SCONES” and set aside. Using a fork, add in the vegan butter and stir a couple times so they become smaller. Stir in the almond milk and mix until you obtain a silky and smooth dough. On a well-floured surface, knead the blackberries in the dough. Using your fingers, pat down the dough to about 1 inch thick. Using a knife, divide the dough evenly into 8 scones. Place the scones on a baking sheet and brush with the almond milk and sprinkle with fleur de sel. Cover with a clean towel and let rest for 25 minutes. Bake in the center of the oven for 20 minutes or until the scones are golden brown.